Radio in Tulsa is rich in history. The legendary Bob Wills broadcast his show and live dances with the Texas Playboys from Cain’s Ballroom every Thursday and Saturday evening over KVOO. The program reached homes across America and soldiers, and fans would write in their song requests and tune in faithfully to listen. 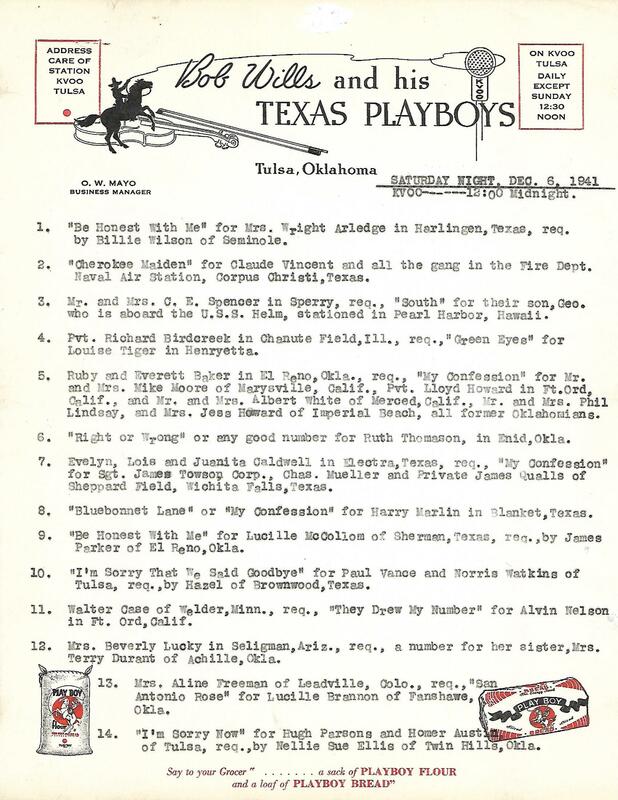 Tulsan Brett Bingham and manager for the new Bob Wills’ Texas Playboys Under the Direction of Jason Roberts, has preserved the original song sheets as part of his personal collection. This specific song sheet was from December 6, 1941 and aired the night of Pearl Harbor. Times have changed a little but western swing is still alive and well. And you, too, can make a song request! Swing on This LIVE with John Wooley will kick-off the Cain’s Ballroom Bob Wills’ Birthday Celebration on March 2, 2019. Submit your song request and tune in to KWGS Public Radio 89.5 at 7:00 p.m. (or attend the show!) to possibly hear your song request read (or played)!